I have been documenting in "Jewish Life in an Increasingly Muslim Europe" how life is becoming intolerable for Jews in France and elsewhere. Beyond the importance in itself that the Jewish exodus from Europe, which began centuries ago, is now reaching its end, the relatively small numbers of Jews are also preparing the way for others to follow suit, as they also want out from confronting an increasingly Muslim continent. Assuming current trends continue – an increasingly domineering Muslim population, pensioners demanding higher and higher subsidies, the Christian faith ever more marginalized – it is easy to foresee millions of Europeans "escaping" to the United States and perhaps other countries, such as Canada, Australia, and New Zealand. When added to the already divergent demographic trends (lots of American babies, disappearing Europe ones), this emigration will further propel American predominance. 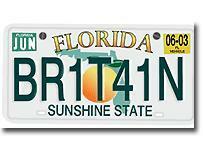 This weblog entry provides intermittent information on a growing topic. Evans-Pritchard reports in London's Daily Telegraph about a significant emigration movement out of Holland, perhaps the first of its sort. Unlike most earlier waves of migration to the new world, this one is not driven by penury. The Netherlands has a per capita income higher than Germany or Britain, and 4.7 per cent unemployment. "None of my clients is leaving for economic reasons. You can't get a visa anyway if you haven't got a work record," said Frans Buysse[, the head of a private immigration consultancy]. Europe's leader for much of the last century in social experiments, Holland may now be pointing to the next cultural revolution: bourgeois exodus. Feb. 12, 2005 update: According to Filip Dewinter, the leader of Vlaams Belang, Belgium's Flemish anti-immigrant party, about 4,000 to 5,000 Flemish residents are leaving Antwerp every year, even as 5,000 to 6,000 non-European immigrants arrive in the city each year. Within ten years, he expects that people of non-European backgrounds will number over one-third of the city's population. Feb. 14, 2005 update: "More people left Holland in 2003 than arrived," informs the Daily Telegraph in an article on emigration from Holland, "Dutch join the migrant exodus to Australia." Feb. 27, 2005 update: "More Dutch Plan to Emigrate as Muslim Influx Tips Scales" reads the blunt New York Times headline over a story by Marlise Simons. It recounts how the murder of Theo van Gogh led to an emigration specialist being "inundated" with messages. "There was a big panic, a flood of people saying they wanted to leave the country." An agency that handles paperwork for departing Dutch was had four times the normal rate of contacts following the murder. Those leaving tell of a general pessimism about their country and about the social tensions that accompanied the waves of mostly Muslim immigrants. The emigrants tend to leave for Australia, New Zealand and Canada. Diplomats from those three countries confirmed the interest, saying they had been "swamped" with inquiries. The reporter notes statistics pointing to "a quickening flight of the white middle class." In 1999, nearly 30,000 native Dutch moved elsewhere, according to the Central Bureau of Statistics. For 2004, the provisional figure is close to 40,000. "It's definitely been picking up in the past five years," said a demographer working at the bureau. May 4, 2005 update: Radio Nederlands informs us that in 1999, nearly 30,000 native Dutch emigrated and in 2004, that figure had gone up to nearly 50,000. These are not just any emigrants but, as the director of a migration consultancy bureau in Amsterdam, Grant King, notes, "Most of our applicants are in high-paying, good, solid positions here - they are not the unemployed. They are mostly middle-class Dutch people with college or university degrees. ... The problem for the Netherlands is that the ones that they don't want to lose are the ones that are leaving." Henri Beunders, professor of history, media and culture at Erasmus University in Rotterdam, notes the role of the Theo van Gogh murder: "The assassin of Theo van Gogh released not only anger but a lot of fear of fanatic Muslims and random violence. It was new for Dutch people to feel physical insecurity, because we are living in a very small country where you can come across anybody." One emigration consultant, Frans Buysse, received four times the usual level of hits on his website in the weeks after the killing of van Gogh. Asked if the Dutch government should worry about this emgiration, Beunders says no, that immigrants to the Netherlands will replace the Dutch who leave. He concedes only that "It will make things a bit more complicated because you have to integrate an even greater number of foreigners into your own country, with all the very complicated regulation systems we have in this country." He also wants to see benefit in this exchange: "Growing mobility, on the other hand, is also a good sign of the growing unification of Europe and understanding of people - I hope." In like spirit, the radio reporter, Sarah Johnson, speculates that "Europe's pioneer for much of the last century in social experiments, it seems the Netherlands may now be pointing to the next cultural revolution: the bourgeois exodus." Comment: It's all very well to put a cheery face on a terrible development, but let's hope no one is fooling himself about the implications for the future of Dutch culture. May 11, 2005 update: The Netherlands Interdisciplinary Demographic Institute (NIDI) issued a report today that insists that immigration and radical Islam are hardly part of the picture at all. NIDI found that 112,000 people left the Netherlands last year and 90,000 came to live in it. The profile of those planning to leave confirms other reports (well educated, ages 35 to 44, good income) but everything else is suspicious. First, the NIDI report finds that 250,000 adults are thinking of emigrating and only 20,000 have serious plans to leave – this at a time when 50,000 Dutch left the country in 2004. Second, the notion that 80 percent of the potential emigrants find Holland too densely populated and 77 percent of them dislike the "Dutch mentality" (whatever that is) makes little sense, as both these conditions obtained 5 and 10 years ago, when emigration was trivial. Comment: This report appears to be another manifestation of denial that Holland is undergoing the throes of deep change. If the insurgents emerge emboldened, what next? In five years' time, there will be even more of them, and even less resolve on the part of the French state. That, in turn, is likely to accelerate the demographic decline. Europe could face a continent-wide version of the "white flight" phenomenon seen in crime-ridden American cities during the 1970s, as Danes and Dutch scram to America, Australia or anywhere else that will have them. In some ways, the faster Europe collapses the better it will be for the U.S., whose chances of defeating global terrorism would improve by a panic-driven influx of the Old World's best, brightest and bravest ready to strengthen it economically and militarily. do not seem to have much confidence in their country's chances of survival. Last year a record number of 121,000 people emigrated from the Netherlands, the largest number ever, while only 92,000 immigrated in. This emigration figure is the highest figure in the entire history of the country so far. The Netherlands is today also the European nation with the highest proportion of emigrants. Since 2003 more people have been leaving the country than entering it. The numbers are rising. In the first quarter of this year 29,000 people left the Netherlands – 5,000 more than in the same period last year. Now Ayaan Hirsi Ali is leaving too. The bell tolls for the Dutch, and those who do not hear it must be deaf. June 24, 2006 update: The Economist has spoken and has decreed that Eurabia is a myth. Jews, no need to leave the continent. 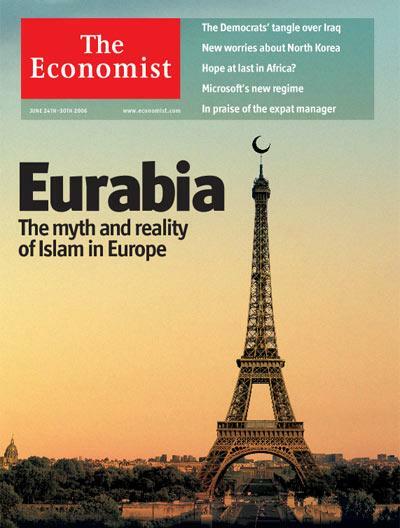 Eurabia on the cover of the "Economist," June 24-30, 2006. July 7, 2006 update: In 2004, Germans for the first time in recent history departed Germany more than they moved to it, reports Die Welt in "Die Deutschen sind überall gern gesehene Einwanderer." The online version lacks the graph in the print version, but I happened to be in Germany today and have scanned it in. The German author Henryk M. Broder recently told the Dutch newspaper De Volkskrant (12 October) that young Europeans who love freedom, better emigrate. Europe as we know it will no longer exist 20 years from now. Whilst sitting on a terrace in Berlin, Broder pointed to the other customers and the passers-by and said melancholically: "We are watching the world of yesterday." Europe is turning Muslim. As Broder is sixty years old he is not going to emigrate himself. "I am too old," he said. However, he urged young people to get out and "move to Australia or New Zealand. That is the only option they have if they want to avoid the plagues that will turn the old continent uninhabitable." 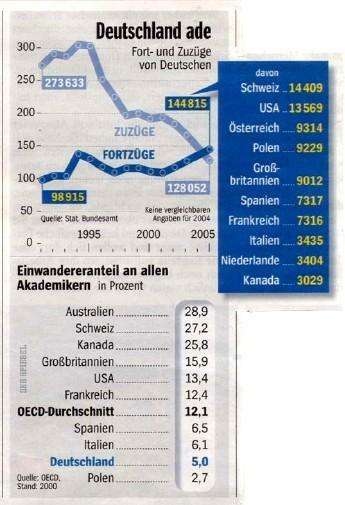 Oct. 30, 2006 update: Der Spiegel reports on German out-migration at "Und tschüs ..." Its most dramatic piece of evidence is the chart, which shows that in 2005, for the first time in recent history, more Germans left the country than entered it. It is noteworthy that the largest number of emigrants went to Australia. The online version is microscopically small, so (again, happening to be in Germany), I have scanned the paper version and reproduce it here. The study found 5.5 million expat Britons - a number that rises to six million if those who live or work part of the year abroad are included. Taken together, they represent approximately 10% of British citizens. ... Over the course of 40 years, some 67,500 more Britons have left the UK every year than have returned - a population loss that has been balanced out by increasing immigration. The number of British citizens who chose to go permanently abroad doubled from 53,000 in 2001 to 107,000 last year - some 2,000 people a week. Sriskandarajah finds that UK economic strength drives the scale and spread of this diaspora by encouraging people to look further. "Britain is truly at the crossroads of the global movement of people. Two-thirds of Britons who leave do so to seek employment abroad - and are replaced by skilled professionals from elsewhere in the world. When the going is good, Brits get going." Lord Triesman, Foreign Office Minister for Consular Affairs, welcomed the report, noting that "Globalisation has increased movement of people both to and from the UK." Comment: What is especially interesting is the completely happy response to these devastating numbers. Any sensible reading would raise the alarm but denial is so much more comforting. Setting up a farm in New Zealand? Start up a business in Tasmania or do you like to cash in on British Columbia's construction boom? All these options were presented at a real 'Emigration Fair' in Amsterdam earlier this month which drew record crowds. Whatever pessimism there is in and about Europe and no matter how commentators try to figure out if this exodus is real, the market has smelled the opportunity and knows how to respond. As opposed to "Give me your tired, your poor" many jurisdictions in the new world have discovered that the disgruntled Dutch are anything but tired and poor. They're young, affluent, well-educated, entrepreneurial, fluent in English. We already knew, courtesy of the Office for National Statistics, that emigration from this country is running at higher levels than at any time since before the First World War, with 200,000 British citizens a year departing these shores. We now learn from the Organisation for Economic Cooperation and Development (OECD) that we lead the world in exporting talent, with a higher proportion of highly skilled professionals emigrating from this country than from any other (except Mexico). The OECD estimates that 1.1 million highly skilled Britons - more than one in ten of the total - are now living overseas. Why this exodus? The foremost reason, as the newspaper delicately puts it, is that "unchecked immigration over the past decade is creating a country many Britons no longer feel comfortable in. ... what the OECD figures reveal, when set alongside the half a million foreigners coming here each year (nearly four million new arrivals since 1997) is a "churn" effect that is fundamentally transforming the make-up of our society." Feb. 24, 2008 update: Emigration from the Netherlands in 2006 actually totaled 132,470, according to a Netherlands Interdisciplinary Demographic Institute study, "Away from the Netherlands: Immigration at the beginning of the 21st century." That number has gone up by 2/3rds since 2000. Two thirds of that number (about 88,000) are of immigrant origin and one third (about 44,000) are ethnic Dutch. Apr. 21, 2008 update: According to the website "Danish Affairs," Sweden is being transformed by the twin phenomena of emigration and immigration: "A population exchange is currently going on in Sweden. The numbers are now comparable to the massive transatlantic emigration of the late 19th century. Kurt Lundgren has done some statistical research [in Swedish]. During 2007 45,418 Swedish citizens emigrated. In 1881the number was 45,992." Apr. 22, 2008 update: Tino Sanandaji of the University of Chicago did some more digging into these statistics and writes me: "While the population transformation through immigration is without doubt taking place and is accelerating, net emigration of ethnic Swedes is modest. Some 60 percent of the emigrants mentioned in the data above were not born in Sweden, but are immigrants returning home (mostly from other EU-countries), while some others are second-generation immigrants returning to their ancestral lands. In all, about 20,000 ethnic Swedes leave the country annually and about 12-13,000 ethnic Swedes return home, making the net emigration number for people born in Sweden about 7-8,000 per year." more people are actually leaving Germany than choosing to make the country their new home. For a quarter of a century, Germany had been a country of net immigration but in 2008 that trend was reversed. The figures for 2009, while showing a slight improvement, are still worrying. ... the Federal Statistics Office released figures showing that 13,000 more people had left Germany in 2009 than had arrived. In total 734,000 people opted to leave the country last year, while only 721,000 immigrated. Although the immigration total showed an increase of 39,000 over 2008, at the beginning of the decade over 800,000 people were choosing to make Germany their home each year. Most of those who chose to leave were foreigners returning home, with the prime destinations being Poland (123,000), Romania (44,000) and Turkey (40,000). Of the 155,000 Germans who chose to leave their homeland, most favored the US and Switzerland. There was a slight dip in emigration, with 4,000 fewer people leaving than in 2008. The global recession is thought to have been a contributing factor here, as prospective emigrants know they will have a tougher time securing jobs abroad. Spain, for example, had long been a popular choice for German emigrants but its high unemployment figures are now acting as a deterrent. Jan. 9, 2012 update: Soeren Kern writes about Spain for the new Stonegate Institute: "Demographers estimate that more than 150,000 native Spaniards left Spain in 2011, on top of 128,655 who left in 2010 and 102,432 who left in 2009. A total of 1.7 million Spaniards are now living abroad. 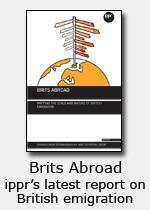 With the economic turmoil set to intensify in 2012, emigration from Spain is expected to increase even further." Aug. 8, 2012 update: The first five months of 2012 saw 52,000 Dutch subjects move abroad, or about 344 a day, up from 47,000 Dutch in the same period in 2011. Jan. 1, 2013 update: In "Les Français s'exilent de plus en plus au Québec," Ludovic Hirtzmann provides stastistics and quotes to explain the thousands of French emigrants to Canada's French-speaking province. But he says not a word about Islam. Nov. 26, 2013 update: The first nine months of 2013 saw 2,185 French citizens emigrate to Israel, an almost 50 percent increase over the 1,469 who did so in 2012, according to Jewish Agency statistics. Overall, 90,000 French have made aliyah since 1948. During the same period, emigration from the United States went down 8 percent. June 19, 2014 update: The Associated Press reports that "Increasing numbers of French Jews are leaving for Israel, citing dim economic prospects and a sense of being caught between an increasingly influential far right and militant Islam. More than 5,000 are on track to leave this year, the most since after the Six-Day War in 1967," which would be over twice the number in 2012 and four times that of 2011. Aug. 8, 2014 update: The mainstream media finally noticed this problem: Newsweek's current cover headline is about "Exodus: Why Europe's Jews are fleeing once again." The article by Adam LeBor is not bad (and represents a major improvement over his naïve 1997 book on the topic of Muslims in the West, something he himself acknowledges in the first paragraph). Sep. 5, 2014 update: For the first time ever, France is now the largest source of immigrants to Israel, with 4,566 of them having arrived in 2014 as of August 31. Jan. 7, 2016 update: "According to Statistics Sweden, some 51,237 people left Sweden" in 2015, a larger number than at any time in the last 160 years. No one's quite figured out the reason for this, however. Jan. 14, 2015 update: Twenty percent more British Jews emigrating to Israel in 2014 than in 2013, 620 compared with 520. At the same time, recorded antisemitic incidents in Britain shot up by almost 40 percent. Mar. 1, 2015 update (1): Great Britain's National Health Service has placed a advertisements in two Australian medical magazines (Australian Doctor, Medical Observer) appealing to British doctors to return home. Given that an estimated 1,500 of them move to Australia every year, this seems like a sensible, if probably doomed effort. Mar. 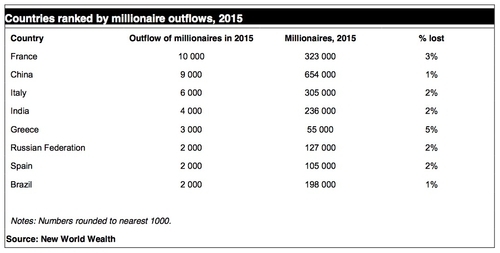 1, 2016 update (2): Millionaires are fleeing Europe –about 25,000 of them in 2015 – according to New World Wealth. "Rising religious tensions between Christians and Muslims, especially in urban areas" is one of the main reasons cited. Data from the German statistics agency, Destatis, shows that 138,000 Germans left Germany in 2015. More are expected to emigrate in 2016. In a story on brain drain titled, "German talent is leaving the country in droves," Die Welt reported that more than 1.5 million Germans, many of them highly educated, left Germany during the past decade. The statistics do not give a reason why Germans are emigrating, but anecdotal evidence indicates that many are waking up to the true cost — financial, social and cultural — of Chancellor Angela Merkel's decision to allow more than one million mostly Muslim migrants to enter the country in 2015. At least 300,000 more migrants are expected to arrive in Germany in 2016, according to Frank-Jürgen Weise, the head of the country's migration office, BAMF. Feb. 11, 2019 update: Emigration from Denmark increased by about 4,000 persons in 2018, some 10 percent more than in 2017.